Here is the toggling circuit I am working on as represented in the iCircuit iOS simulator. Here I have my 3.3v switching regulator (TPS62056DGS) represented by an op amp with a reference voltage at 1.3v. I am representing an input pin of a 3.3v microcontroller with the second op amp. 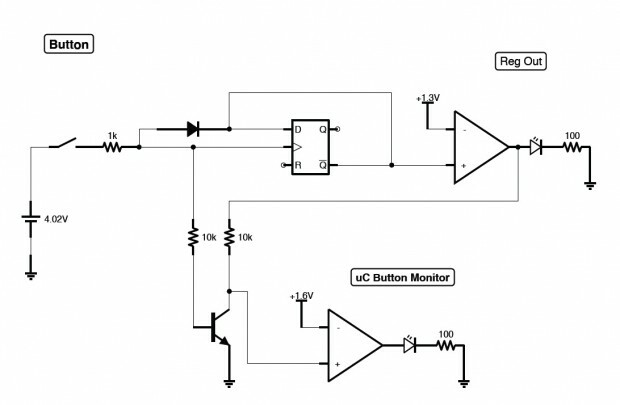 This circuit works as follows: The when the switch is closed battery current is conducted through the 1k resistor and the diode into the enable of the voltage regulator. When the voltage reaches 1.3v the regulator switches on, outputting 3.3v and powering up the flip flop and other circuitry. The flip flop powers up in its default/unset state holding the regulator enable high with its Q’ output. The button is released and the clock line goes low. The diode prevents the flip flop output from holding the clock high (only a rising edge clocks in the output state bit). Upon the next rising edge of the button press the flip flop clocks a 1 into the Q output making the Q’ output 0 disabling the regulator and shutting itself down. The transistor circuit allows a uC to read the inverted state of the button press. Not shown in this circuit are the asynchronous flip flop inputs needed to lock the output so it does not toggle while the microcontroller is monitoring button presses, and the input allowing the microcontroller to shut down the circuit. I plan to use the 74LVC2G74DP,125 flip flop, but as mentioned before the circuit is prototyped with another one. The standby current of this circuit is less than 4uA, and the power efficiency at 100mA load is about 90%.